For a couple of months now I have been in love with No-me. No-me, also known as Naomi, is an illustrator and designer from beautiful Surrey and she was the very first lovely to sponsor this wee blog. Naomi's illustrations are just wonderful. They are simple, bold and super fab! My favourites are THIS, THIS and most of all THIS. So for being so darn talented and being TTDER's first sponsor I thought I had better introduce you properly. Umm I think as I'm an Illustrator I will have to go with: creative, bonkers, inquisitive, quirky, colourful. However I assure you there is method in my madness! I have been drawing my whole life. I grew up with mountains of pens and paper around me. My dad used to make me draw on both sides of paper because I was getting through it too quickly! I enjoy drawing so much. It's my ultimate favourite thing to do. I'm so happy that I've carried something I love so much through my childhood and into my adulthood. What has been your most favourite project so far? I really enjoy working on commissions for people as I find that they can suggest things that I would have not thought of drawing. It’s great to try new things. My favourite project so far was recently featured on the Rock My Wedding Sister site called The Love Lust List. 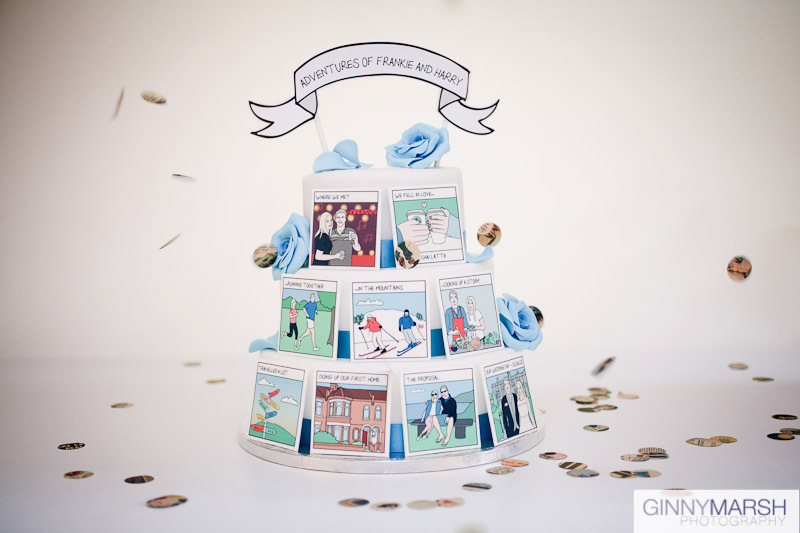 It was a no-me adventures illustration made into a wedding cake. It was absolutely amazing! It combined my two loves – drawing and cake! It would be really interesting to draw an illustration, possibly a no-me adventures for someone in the public eye. It would be cool to see what things they would want included. You get to see a little glimpse of peoples lives when you draw things they love and I feel very lucky to have a job where I interact with people on such a personal level. I try to keep it neat and tidy but in reality I’m always so busy, it always looks a complete state! I have just moved house and have a new office. The main feature in the office is my blackboard wall. I love it! However maybe drawing on the walls should not be encouraged! What would you say your 'go-to' tea is? I don’t drink caffeine so my favourite tea is Rooibos tea (or Red Bush) by Tick Tock. It’s got an unusual taste and it’s much brighter than normal tea. It’s very refreshing and I drink it all day! With your tea, what treat would you have to accompany it? 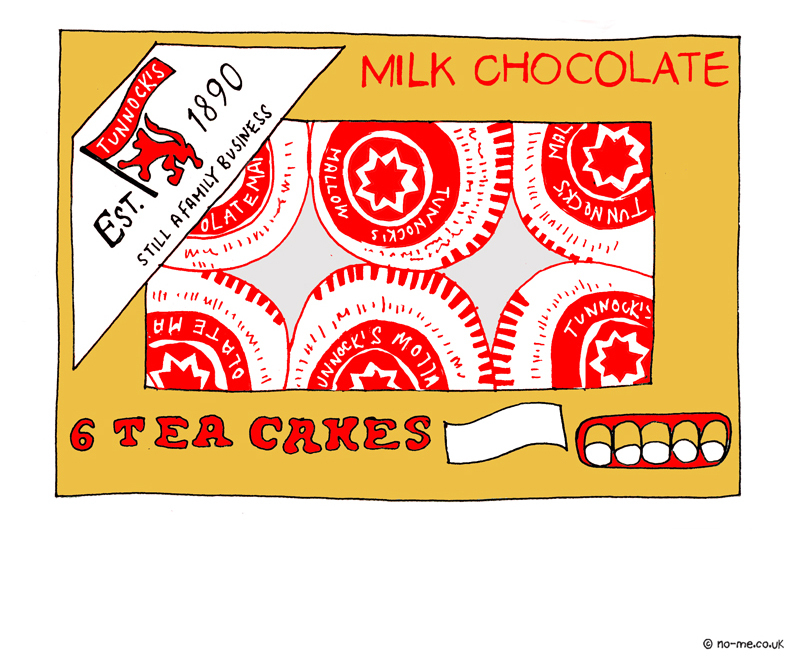 I absolutely LOVE Tunnock’s teacakes. I eat them all the time and can’t get enough of them. All time favourite treat! If you were to have any milkshake flavour in the world, what would it be? It would definitely be a Banana Milkshake. 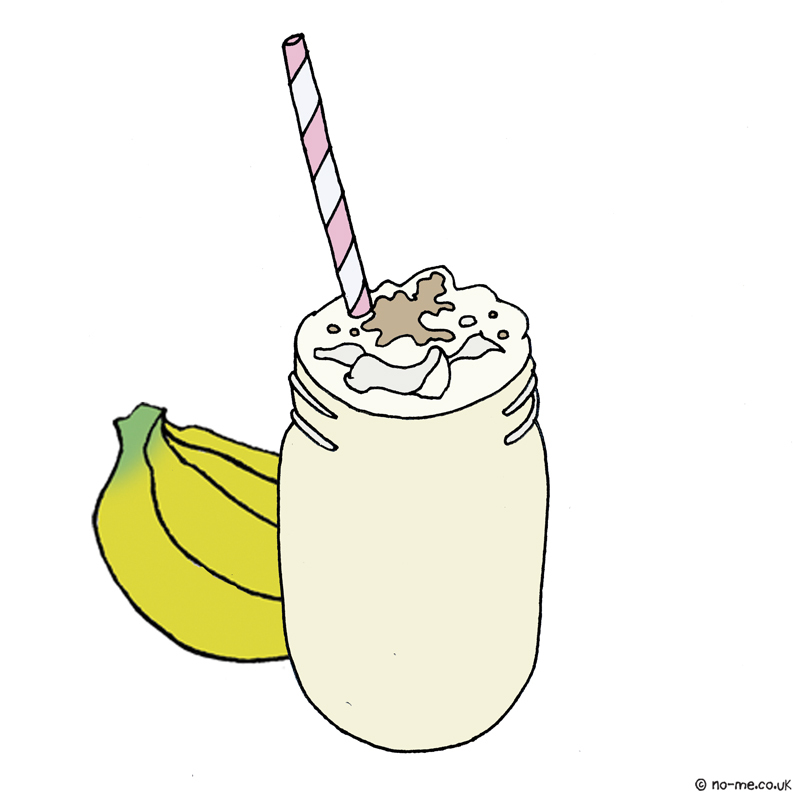 Bananas were made for milkshakes! The perfect combination. This year I went to Sweden and I absolutely loved everything about it. 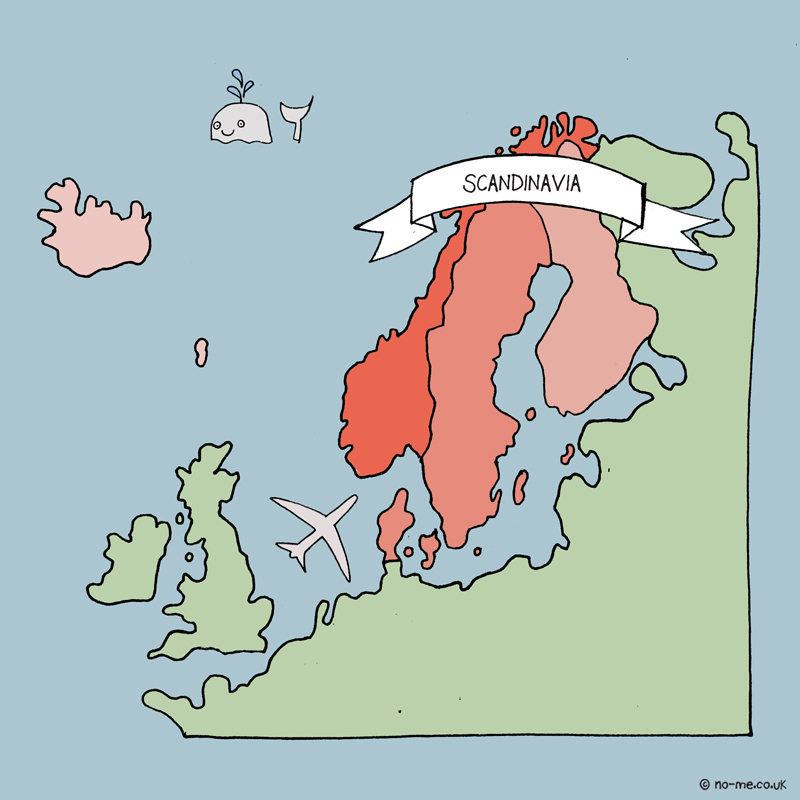 I really would like to visit more of Scandinavia. It has such beautiful countryside and amazing cities. The houses and buildings are stunning. I loved how they decorated EVERYTHING. Even the airport looked more beautiful than normal ones. I must go back! For more information, commissions and all things No-me, visit Naomi's website and like her on Facebook for updates, discounts and giveaways. To purchase a piece of her wonderful art hop over to her Etsy shop, I know I will be.